Almotamar.net, AP - BAGHDAD (AP) — Iraq's government welcomed reports Wednesday of a U.S. combat troop withdrawal next year and said Iraqi forces would be ready to take full responsibility for security. Prime Minister Nouri al-Maliki supports an accelerated pullout and Iraqi officials will work closely with American commanders under a possible timetable to remove U.S. soldiers from the battlefield by August 2010, said Sadiq al-Rikabi, one of al-Maliki's top advisers. The comments come after reports that President Barack Obama was expected to order all U.S. combat troops to leave Iraq by August of next year. An announcement by Obama could come as early as this week, a senior White House official told The Associated Press on Tuesday. Al-Rikabi said al-Maliki expressed "no worry" about U.S. forces moving out quicker than the standing agreement for a withdrawal by the end of 2011. 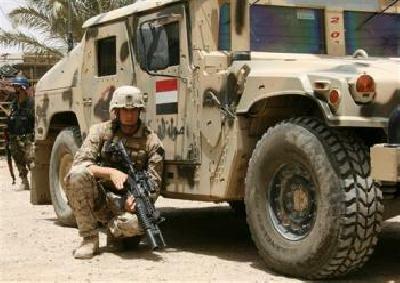 "The Iraqi troops are ready to take responsibility. There is nothing to worry about and the withdrawal will be carried out in coordination between the two sides," he said. Obama's announcement will speed up the timeline of a U.S.-Iraqi security pact, which took effect Jan. 1, calling for American troops to withdraw from Iraq's cities by June 30 and completely pull out troops by the end of 2011. For months, al-Maliki has publicly said he believes Iraq's security forces are prepared to stand on their own despite lingering questions about their readiness. But the withdrawal of combat troops under Obama's plan would still have U.S. troops in Iraq well after parliamentary elections this year, which military officials have said is one of the next big security tests. There are more than 140,000 U.S. troops in Iraq. Reaction among Iraqis was mixed. "I have no trust with Iraqi security forces that they could keep security because army and security forces were built on a sectarian basis," sad Thabit Mohammed Jassim, a 40-year-old Sunni shop owner in Tikrit, Saddam Hussein's hometown. Jassim said he believed violence would likely climb after American combat troops leave Iraq. "Obama wants to withdraw not for Iraqis, but because of economic problems they face internally and of hardships his troops are facing in Iraq," he said. But Hussein Jassim Mohammed, a 35-year-old Shiite from Baghdad, said he would like to see U.S. troops leave sooner rather than later. "We hope the withdrawal will take place sooner, before the given timetable," he said, adding that it was "a good step for Iraqis to secure" their own country. Mohammed said there were some who worried about an increase in violence, but said it was time for "security forces to live up to their responsibility." But in Mosul, where U.S. and Iraqi forces continue to battle insurgents, Ziyad al-Sinjari, a 35-year-old Sunni, was less optimistic about the stability of the Iraqi security forces. "The new Iraqi army lacks experts. It needs the expertise of former Iraqi military officers," said al-Sinjari, who works at Mosul University. "I hope the withdrawal will be soon, so militants have no pretext of launching attacks against Americans in cities and hurting (civilians)." In Najaf, a Shiite shrine city in southern Iraq, Ibrahim Ihsan said he wants to see foreign forces leave Iraq. "I have no doubts that Iraqi soldiers are qualified to shoulder the security responsibilities in the country," said the 55-year-old retiree.